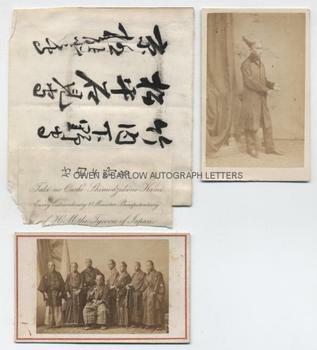 JAPANESE MISSION TO EUROPE 1862 Signatures & Photographs. Takenouchi Shimodzukino Kami, Envoy and Plenipotentiary to H.M. the Tycoon of Japan and other members of the Japanese Mission. 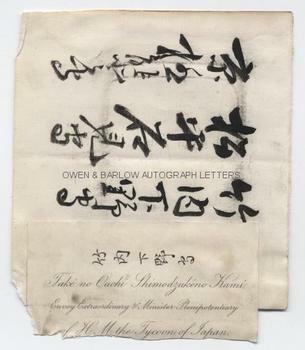 Paper with calligraphic signatures (of three persons?) in Japanese script, with printed paper slip attached, partly in Japanese and partly in English "Take No Ouchi Shimodzukino Kami envoy Extraordinary and Minister Plenipotentiary of H.M. the Tycoon of Japan." 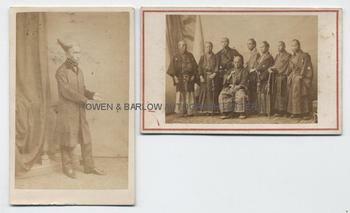 Together with two rare carte de visite photographs showing members of the first Japanese Mission to Europe, which took place in 1862. 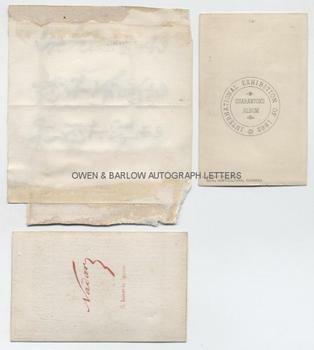 The SIGNATURE (or signatures) are on a paper piece measuring approx 4.74 x 4.25 inches. The last word is "Takenouchi" and the first two are presumed to be "Shimodzukino" and "Kami". The calligraphy appears to be all in the same hand. The two albumen carte de visite photographs measure approx 4 x 2.5 inches (including the original photographers' mounts). The first is by Felix Nadar (with his printed details on verso) and shows a group of 8 men of the Japanese Mission dressed in traditional Samurai robes and with their swords. The second shows a Japanese gentleman (believed to be Takenouchi), full-length in western clothes, save for an eboshi hat. The verso bears the photographer's printed details, L. Birnstingl & Co., Royal Horticultural Gardens, International Exhibition of 1862, Guarantor's Album. The paper piece has mounting traces to verso and slight loss to lower left corner (not affecting signature) but is in very good condition. The two albumen photographs are in fine condition. The 30 strong Japanese Mission sent to Europe by the Tokugawa Shogunate (the 'Takenouchi Mission') was an historically important event. It was sent to learn about Western civilization, ratify treaties and trade agreements and delay the opening of cities and harbours to foreign trade. It was, effectively the first Japanese Embassy to the West. The men of the mission were known as "the Last Sumurai" and this was certainly one of the final occasions on which the Samurai were involved, as the Samurai were abolished by the Meiji restoration of 1868. Whilst in Paris, members of the Japanese Mission were photographed by Felix Nadir and Jacques-Phillipe Potteau. When the Mission moved to London, it is known to have visited the 1862 World Fair, where the PHOTOGRAPH by Birnstingl would have been taken. These are important and rare images and record what are amongst the first Japanese diplomatic encounters on European soil.